While I was in NYC last month, I got a chance to sit down and talk with Chris Chippindale, COO of Public Service Credit Union in Denver, Colorado. We talked about the intersection between credit unions and technology, and how that affects members’ security. This interview happens to be 360. Feel free to grab a headset and look around–you’ll see my friend Kristie in there with us, too. Or, if you’re watching on a PC, click and drag your mouse to move your viewpoint around. Femme: All right, hi, everyone! This is Femme Frugality and I am here with Chris. Chris do you want to tell us where you’re from? Chris: Sure. My name’s Chris Chippindale. I’m the COO of Public Service Credit Union in Denver, Colorado. Femme: Awesome, awesome. We are going to talk with Chris today about credit unions. I was wondering if you could tell me a little about what a credit union is and how it differs from a bank. Chris: Sure. Credit unions are similar to banks in the sense that we offer more or less all the same financial products, but our mission is what really differentiates us from banks. We’re not-for-profit so we put the interests of our members [first]. That’s versus banks who have customers and they’re focused on profits. What that means to you on a personal basis is that you should expect to see better rates. Lower on lending, and higher on savings. 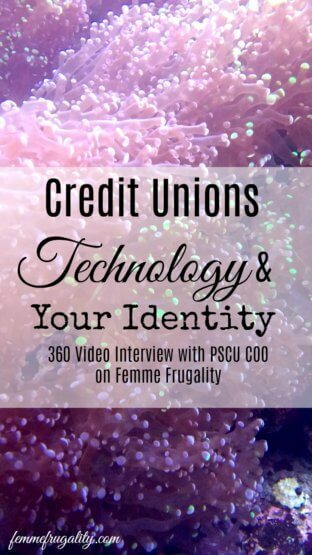 How Do Credit Unions Use Technology? Femme: Awesome. That’s amazing. So we are here at CO-OP THINK, and I know CO-OP is pretty much the technology behind credit unions that takes their ATMS and their credit unions across the country, and makes it so you’re able to access it just like your credit union at home. I know that technology is super important to credit unions. I was wondering if you could talk to me a little bit about the history of that relationship—credit unions and technology? I know that you guys were pioneers with a lot of these technologies, so I’d love to hear about it. Chris: Yeah, we were [pioneers,] and I think one of the big reasons technology is so important to credit unions is, first and foremost, we don’t have the resources to go out there and build branches the way a large bank does. So we use technology to level the playing field and be able to compete because we know members of credit unions still need access to financial services. We can’t go out and build hundreds of branches across the community or across the state or across the country, so we use technology to be able to reach out. A couple things CO-OP does for us? My credit union, as a member of the CO-OP network—our members can go to ATMs at any other credit union that also participates in the network, and use those ATMs surcharge-free. Instead of paying $3.50, $7, $10 to get your money out of an ATM, you can go to a CO-OP ATM, and they won’t charge for that. Femme: I know they were saying earlier that that network is larger than a lot of those big, major banks. Chris: Yeah, it would be larger than any one bank’s network. Chris: One of the other things CO-OP does with us is something called shared branching, where, again, if you participate as a credit union in the shared branching network, your members can go into branches of other credit unions and transact business there. That’s another nice way to supplement our limited resources. My credit union in Denver, we have 20 branches in Colorado, which is the most of any credit union in our state. That certainly pales in comparison to some of the banks with their branches out there, but by partnering with other credit unions, my members can go to other branches within the state or across the country and get service there. Why Do I Have to Use Chip Cards? Femme: One big tech issue that I think impacts everybody, but not necessarily everybody understands, is on our credit cards, and in some cases debit cards, I believe—that little RFID chip? What is that? And how does it work? Can you explain that in layman’s terms for us? Chris: Sure. It’s a protocol that allows the card and the terminal to communicate. So instead of swiping the MAG stripe, you’re inserting the card—most cards have the chip these days. It’s just another way to allow the transaction to go through. Femme: And are there any security concerns with that technology? Chris: There are. I’m not an expert on that, but there certainly can be a case of intercepting transmissions from time to time. It’s a more secure technology than just the mag stripe. It’s something that we’re always wary of, but we do believe getting away from the mag stripe is making cards more secure. The chip in particular—that’s probably more common these days. The chip itself puts in a cryptogram every time you insert it into the machine. So if you were to get someone’s card number in the past, that’s basically all you needed to commit fraud. Now with the chip, you need the card number plus this secret code, if you will, that changes every transaction. It made chip-on-chip transactions more secure. It hasn’t helped online, but it helps in retail environments, etc. What Are Today’s Biggest Financial Security Risks for Consumers? Femme: Gotcha. As we’re looking forward, what are some of the security issues of tomorrow, and how are credit unions working to address those? Chris: Sure. As we’ve seen an improvement with the chip-on-chip technology, the two big things my credit union and many other financial institutions are seeing this year are account takeover fraud and online fraud. One of the things you can’t do with your chip card is stick it into your phone or stick it into your computer for a chip-on-chip transaction, so most of the cards out there today still have the mag stripe information. Bad guys are getting that and committing fraud. They’re doing it online and they’re doing it at places where the merchant doesn’t have a chip card reader. What Will Payments Look Like in the Future? Femme: This is totally theoretical, but is that something you think we could start seeing in the future? [Sticking your card into your phone or computer.] Like now I can plug my memory card directly into my computer. Ten years ago I couldn’t have done that. I would have needed an external drive, and before that, I might have even just had to go to Target or Walmart where they had those capabilities. Chris: I don’t think so. I’m not going to predict the future, but what we’re seeing happening is this idea of tokenization. So more along the lines of Apple Pay or Samsung Pay where the whole card number changes every time. So you’re not sitting there with a static, 16-digit account number on the card all the time. Every transaction would be unique. So I think that’s where we’re headed. Every transaction will be unique, and account information is “one-time,” if you will. Femme: Very cool. We just came out of a panel, and one thing that came up that I thought was kind of interesting was social media and what kind of a precarious situation we all put ourselves in without even really thinking about it. I work in an industry where people go as far as listing out their financial data online as a way of tracking and accountability. It really helps a lot of people, and it builds community. But when they [in the panel] were talking about different social media profiles making it easier for people to hack your accounts—is there anything specific people can do to protect themselves? And/or, I know they said that CO-OP specifically was looking at this issue? Chris: I would say my guidance is—you know, I’m a little bit older, and don’t fully understand some of the draw about social media and putting so much information out there, but it happens. It seems to be “the way of the world.” I would just caution people about how much information you put out there. It’s certainly great to let people know what’s going on and where you are and things like that, but that’s potential information that can be used against you. When our members call into a communication center and you can’t see them eye-to-eye or get their ID, we ask [for] information that we would hope only they would know. The more information we put out there, the more likely it is that the bad guy can start piecing some of these pieces of information together to start figuring you out, and start getting past some of the techniques that we use on our end. So we always caution people about how much of that they’re sharing. This entry was posted in Money Management on June 30, 2017 by femmefrugality. Thanks for sharing! Credit unions can be great resources for many people. They have a local feel and more personable experience.